Patie, a male character, is the Gentle Shepherd, in love with Peggy. 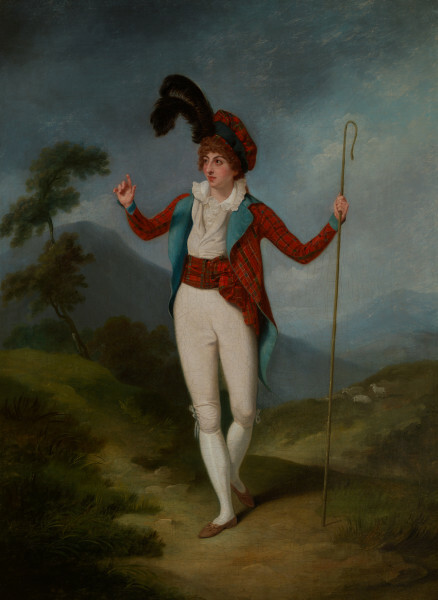 "He" holds a crook, and has a red and green plaid tam-o’-shanter with a green band and plumes, brown shoes with pink bows, white stockings, white breeches with blue bows, a long jacket in red and green plaid with a blue lining, and a red and green plaid cummerbund. Maria Theresa De Camp, who married Charles Kemble, played Patie for the first time on 8 June 1796, at Drury Lane.